Page 3 - Finshed Puppy Book1. 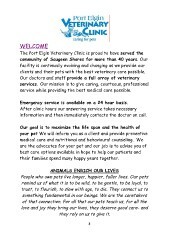 clients and their pets with the best veterinary care possible. service while providing the best medical care possible. Emergency service is available on a 24 hour basis. information and then immediately contacts the doctor on call. their families spend many happy years together. they rely on us to give it.